Mass Savers Mall Combo Package at Copley Place (Ends Today)! If you are near the Copley Place Mall today and are looking to make your place more energy efficient, you may want to check out this offer from Mass Save and NSTAR! 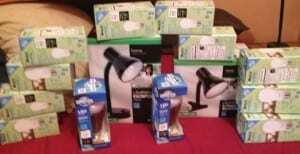 For only $10 (+ .63 for tax) you will receive: 10 Incandescent Style CFLs, 2 Incandescent Style LEDs, 2 Desk Lamps, 2 LED Night Lights, a $100 value!! You can also grab Advanced Power Strips for $15, a $35 value. The only thing is both these offers end today at 6pm, so if you are interested you may want to head over to the Copley Square Pedestrian Bridge between 10am-6pm to take advantage of this great deal. You can find this deal at a kiosk on the Pedestrian Bridge, near the entrance of the Copley Place Mall on the left side if you’re coming from the Prudential Center. Hat Tip and Photo Credit to Omari!